What started as a vacation ended up being a transformative trip that has become a lifelong passion and an awarding-winning music project for jazz musician Jane Bunnett. 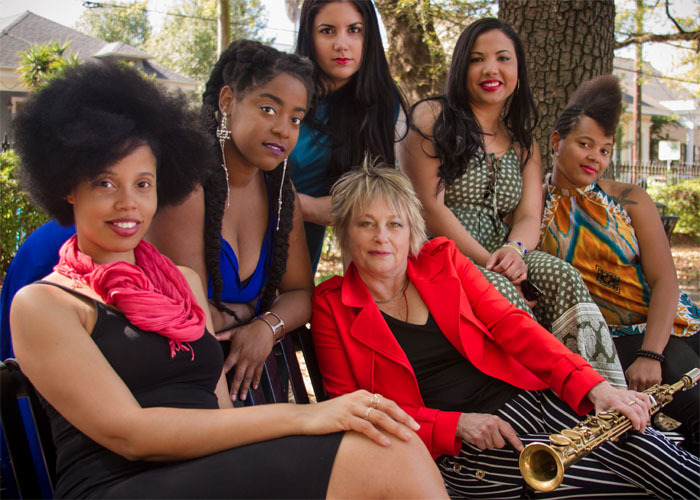 For the first time, Bunnett is bringing her Grammy Award-nominated group Maqueque to Savannah for the 37th annual Savannah Jazz Festival. Bunnett and Maqueque will play the bandshell at Forsyth Park, for free, at 7 p.m. Sept. 29. It’s rare in the jazz world for an all-female outfit to even assemble, much less one steeped in the rich traditions of Afro-Cuban jazz music. Bunnett, a Canadian, five-time Juno Award winner and three-time Grammy-nominated musician, traveled to Mexico several times in the 1970s, but each time, she would get sick. In search of a new vacation spot, she heard about Cuba from a friend. She found an ad for a cheap trip and decided to check it out. That was 1982. What she didn’t plan on was the enriching experience she would have almost immediately after stepping off the plane. “The moment we got to Cuba, there was music everywhere,” Bunnett said. She and her husband, Larry, were both accomplished jazz musicians at the time. They brought their horns on that first trip to Cuba and it didn’t take long before they were sitting in on sessions with local musicians. They bought records. They met people. They became fully immersed in Cuban music over the subsequent decades. The music of Cuba is some of the most diverse in the world. With African rhythmic roots, Spanish influence, European sprinklings and Caribbean flavor, the depth of the styles and fusions of genres has enriched the worlds of jazz, salsa and Afro-Cuban jazz. “Cubans are natural collaborators,” Bunnett said. “They’re very open about wanting to engage with other people and then create. I really thrive on collaborative projects. That really worked for me. That first trip in the early 1980s set off a love affair with Cuba for Bunnett. The first album they produced of Afro-Cuban jazz was “The Spirit of Havana,” which garnered multiple awards and acclaim for Bunnett, and was recorded with a number of legendary Cuban musicians. She began a program to bring instruments to the island, and through that program found her next project. On one recent trip with the program, she noticed that the majority of players in the jam sessions were men. There were plenty of women enrolled in the many music conservatories, but they were not participating in the sessions like the men. Bunnett set out to change that by creating her own all-female group comprised of Cuban women. “I hardly saw any of the young women at these jam sessions,” Bunnett said. “I felt like, wow, the time is right. I felt like maybe I could do something. It was a one-off project. I didn’t expect it to take off like it did. Maqueque, “the spirit of a young girl,” was born. Currently the group is comprised of Bunnett on soprano saxophone and flute, Melvis Santa on vocals and percussion, Mary Paz on percussion and vocals, Danae Olano on vocals and piano, Talin Marrero on vocals and bass and Yissy Garcia on drums. At one time, Dayme Arocena, a now world-renowned Afro-Cuban vocalist, was in the group as well. The first eponymous album they cut, which followed a rough rehearsal and recording process due to power outages and broken equipment, ended up garnering a Juno Award — the Canadian equivalence of a Grammy. At the time, though, she barely knew the group and they hadn’t performed together a lot. After the first album took off, Bunnett took the group on tour. Their second album, “Oddara,” was nominated for a Grammy and capitulated the group to playing festivals around Canada and the U.S.
Bunnett and Maqueque will be playing tunes from both of their albums, as well as new tunes they are set to record in early December.